In May 2002, Dallas area musician and educator Jerry Bishop saw the great number of students and schools in the Dallas/Ft. Worth metroplex in need of a strong band and music education program. While such instruction is currently available to many students, still a large number of families find the expenses of learning an instrument: instrument rental or purchase, books, sheet music, instruction, trips, performances, etc., overbearing. To help relieve these economic pressures and make this music education more accessible, the Music Learning Foundation was formed. The foundation was also formed in part, as a tribute to Jerrys mother, Patricia Bishop, devoted and accomplished pianist and educator, who passed away after a battle with cancer in November of 1998. 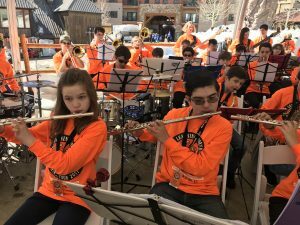 In general, the Music Learning Foundation sponsors the entire experience of being in a school band for students who are not financially able to participate on their own. In most cases the childs family has already agreed to make sacrifices to send the child to a private or charter school. Oftentimes this act alone drains the family of the extra money needed for what many would call a fun luxury of being in a band. Our staff and volunteers view learning a musical instrument as something much more than simply a luxury.